There are some recipes out there that you try and immediately wonder "where has this been all my life"? Well, this is definitely one of those recipes. I've heard of sopapilla cheesecake, but it always seemed "too simple" to impress anyone. I mean, it's just a handful of ingredients, what's impressive about that? But, simple to make doesn't mean simple tasting. A cheesecake to please a crowd is what I found when I made this. In reality, this might be one of the easiest desserts I've ever made. It's literally crescent roll dough, cream cheese, sugar, butter and a cinnamon sugar topping. 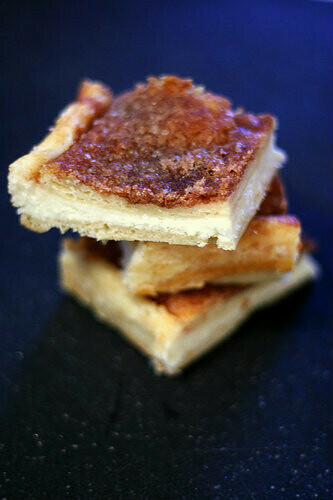 I love everything about that list, but the cinnamon sugar topping is what hooked me in to finally trying this recipe. Unroll 1 can of the crescent roll dough and lay flat in the bottom of a greased 9x13 baking dish. Stretch to cover the bottom of the pan. If you're using regular crescent rolls, make sure to pinch any seams that opened up to close them. Mix together the cream cheese, 1 cup of sugar and vanilla until smooth and combined. Spread evenly over the crescent roll dough. Top with remaining crescent roll dough, again stretching to cover, and sealing any split open seams. Pour melted butter all over the top of the crescent roll. In a bowl, combine remaining sugar with the cinnamon. Sprinkle evenly over the melted butter. Bake for 30-35 minutes until top is golden brown. Let cool on a wire rack for about 30 minutes and then refrigerate until completely chilled. Cut, serve and devour! This sounds AMAZING! Thank you for sharing. Love simple recipes! This stuff is so dangerous. A coworker at my former office used to make it, and it was gone so fast. Yours looks great and now I am really craving some! This looks so easy and yummy! Thanks for sharing! Yum, your cheesecake bars look so delicious! This looks so nice!!!!! What a great idea, it looks as though they are crunchy bu also cheesecakey- it's a perfect combo!! Wow, that looks definitely like a keeper recipe! Fast and delicious. Thanks.